Now think horizontal ball bearing sized hail stones, gale force winds, lightening strikes. Picture from training run to give a flavour. Now multiply by ten. Good. 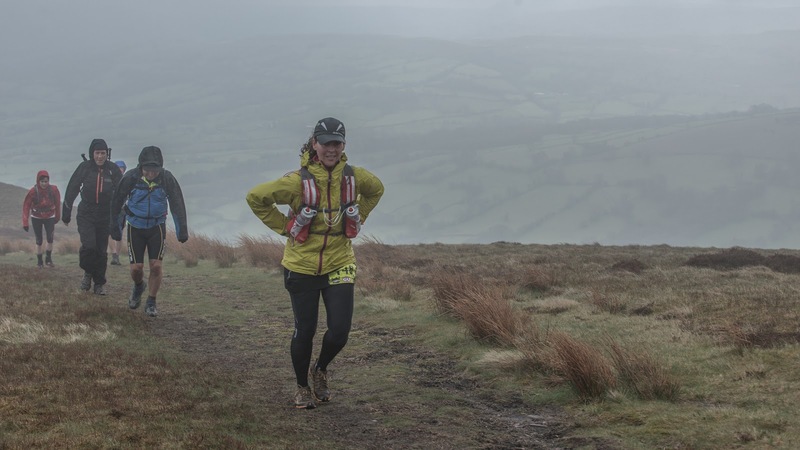 This is the reality of summer running on the Beacons. I was thinking just a few days ago, when the forecast was warning of bad weather, that nearly all the events I have ever taken part in have been done in horrible conditions. Recent exceptions being the Black Mountains Roundabout (2010) and the Lakeland 50 (2011). Yesterday's conditions come top the 'bad' list. Given the history, it is clear that I never learn. When it comes to the weather I am a blind optimist. Early yesterday morning, at the Might Contain Nuts event HQ I chatted with friends, old and new, about how unexpectedly mild it was as the sun shone down, and believing that spring had truly bedded in I shed a few layers and stashed them back in the van. Fast forward 40 minutes and atop Tor y Foel, having tackled the first climb, my error was realised when the weather turned nasty. Forward another 3 hours and I was considering pulling out as I donned my waterproofs for warmth and huddled round a cup of tea at Storey Arms wondering if my swollen hands were a sign of mild hypothermia. The course is particularly tough. It's the sort of course I would never plan for a training run because there are detours off ridges for no reason other than to punish you with climb back to the top, the worst of which comes at mile 30. The North face of Cribyn. This is a climb I have never considered doing before because it has never seemed a reasonable or attractive thing to do. But it had to be done yesterday. It had to be done whilst clinging on to tufts of grass to avoid being blown off the ridge, with hat, buff & hood exposing only enough eyeball to allow me to see where I was placing my foot. But after 8 hours of crazy weather you become conditioned to it. The sting of the hail becomes invigorating, the contrast of rainbows and dark skies enhance the beauty, and the flash of lightening provides a much needed shot of adrenalin to enable you to fly down the sharp descents. It occurred to me that I had grinned like a maniac through all of this for the final 6 miles. It was just great fun. 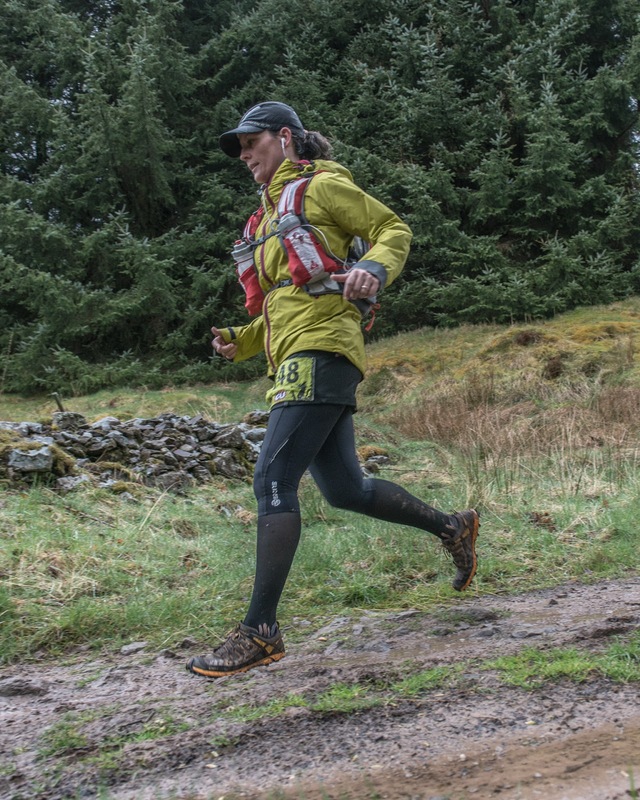 As with the other ultra marathons in their portfolio, this MCN event requires the participant to take care of their own nutrition whilst they provide water and gels at selected checkpoints. Support at the checkpoints from the team is abundant and this being the third MCN event I've done, I have nothing but praise for the organisation and support they provide. I clocked just short of 41 miles and 7850 foot of ascent covered in, I think, 11 Hrs 5ish minutes. Not bad for me and given the conditions I am very happy. My aim was to do the round comfortably; not to wear myself out; to finish feeling like I could do more, and to be able to run my 15 mile road run on Sunday. I achieved all of these.